Many exotic and unusual materials have been used to create buildings from tires to plastic bottles but did you know wooden pallets could be used as well? 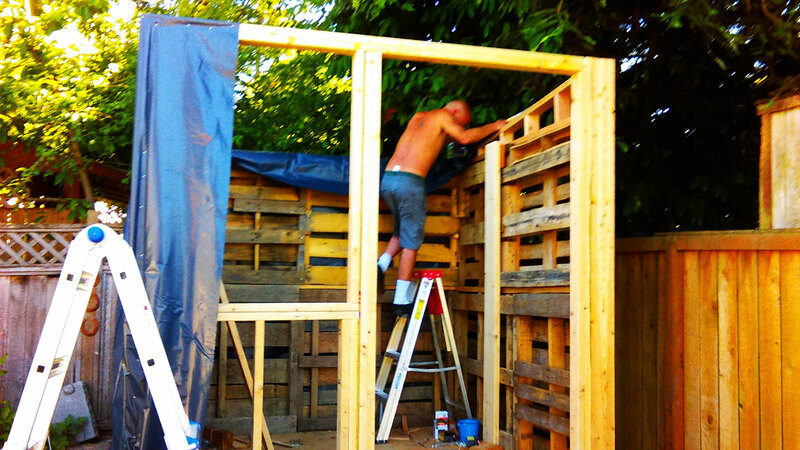 Bonnie Grant does and in her continuing blog series, “The Wonderful World of Pallets: Building a Pallet Studio”! she shows us how. 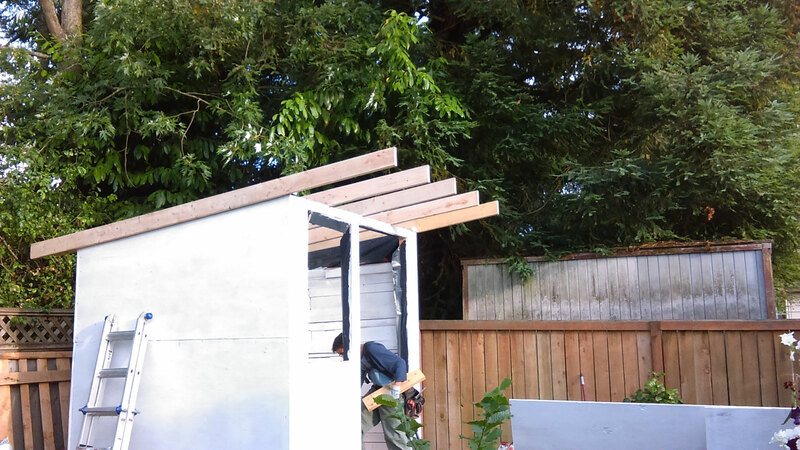 In this fourth installment, she shows us how to add a roof to a pallet studio! The roofing proved to be more of a challenge and we had to have a friend of ours do the design. We knew we wanted a simple “lean-to” style, single sloping roof but had no idea on how to achieve the look. First challenges were how to get the pitch and then how to build up the front so the roof would slope to the back of the building. These problems were solved by building trusses. Again, our friend built these, so I will summarize his instructions. The material is standard 2 x 4 lumber. You want the slope of the roof to be 15 inches for every 12 feet of roof. You use an L-square to measure the rise and run of the angle. It must be 6 to 7 degrees off horizontal. 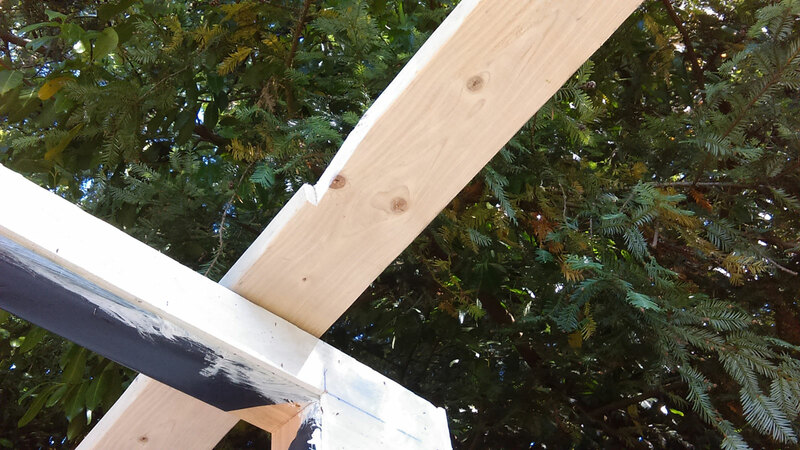 The two trusses measure 8 feet in length, spanning the front to the back of the studio. The highest points of the trusses are 7 inches tall and the lowest is 2 inches at the rear of the building. The form is basically a trapezoid with just one pair of parallel sides and the longer board on to narrowing in to reach those points. The base board is horizontal and sits on the cap of the walls. In between these are vertical boards spaced every 6 inches. This braces the truss and allows it to take on the additional load we will be installing with the roofing timber. This is when things get really exciting because you can start to see a fully formed building and the vision is finally being realized. Once the trusses are put into place, you will need 6 (2 x 8) 12-foot boards as the main material. These are set using a “bird’s mouth” cut (a special cut that allows the rafters to sit on the wall boards). The exact angle you cut depends on the angle of the slope of the roof. 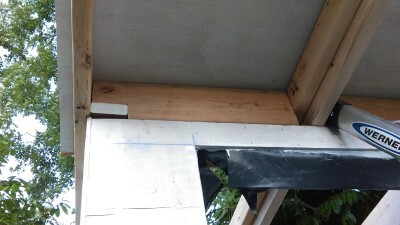 The cut is horizontal to the front and back beams to which it will attach while the angle cut into the board will mimic the slope of the roof. You can also purchase metal plates that will perform the connection for you without making special cuts. Once you have the cuts on all the boards, it is a fairly simple matter to install them. Each is set in with the 2-inch width of the board nestling onto the front and back wall boards. Toe nailing or screwing these in creates the support structure for the roof. 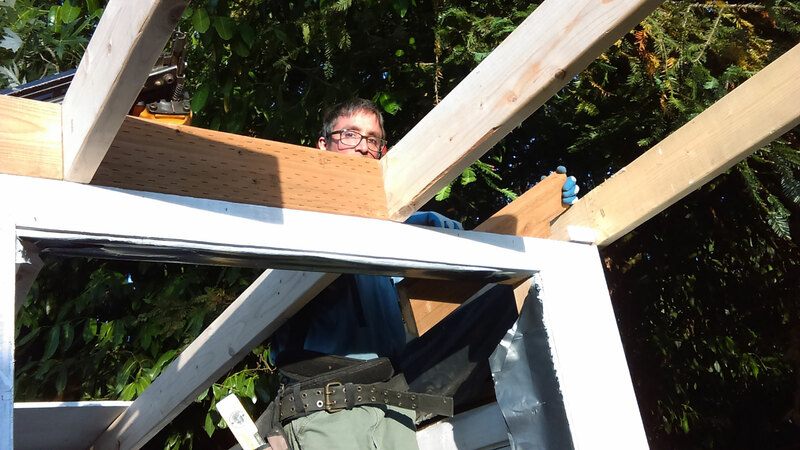 The second and fourth rafters are further reinforced by adding a 2 x 4 set flush against them. More 2 x 8 boards are needed to cut into sections that brace between these rafters as additional support. 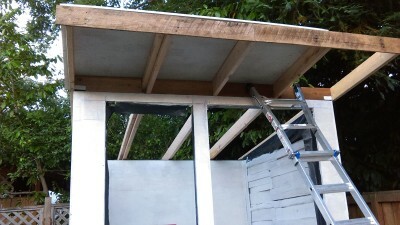 Cap the front and back of the roof overhang. Next, put the surface of the roof over the rafters. We used three sheets of 1-inch thick plywood, primed on both sides and on all the cut edges. Nail these in, starting at the top and moving down to the back of the building. The final sheet of ply will need to be trimmed to fit. Apply caulk at each end of the caps and where the plywood joins them. The roof needs more protection, so we laid a sheet of roof felt over the top using heavy duty staples. Next, you will need roofing nails and sheets of roof tiles. You can also go with a corrugated roof, shingles, or any other suitable material. We used composite tiles with flanges already in them to ease the installation and create a form for the overlap. Installation starts at the lowest edge of the roof and works upward. Trim the tabs off the first line of tiles and nail them into the ply. The edges of the first line, and each on up, should overhang by 1/8 inch to keep water dripping away from the building. The next tiles are laid over these with the tabs at the lower edge of the roof. You will be nailing in successive layers, which are staggered, so the tab notches do not line up directly with the gap of the shingles below. To accomplish this, trim off tiles into different sizes. Some guidelines for best alternating of the tiles would be sheets of 6, 12 and 18 inches. Nail tiles in just below the tar strip. The packaging on roof tiles will contain further guidelines and dictate the exposure needed between shingles. A pneumatic nail gun is most useful in this process but you can also hand nail the tiles into place.